The Qatar Team began this year’s WPPA Class 1 World Powerboat Championship campaign by recording excellent third and fourth places in a fascinating Greek Grand Prix in Palaio Faliro Bay yesterday. His Excellency Sheikh Hassan bin Jabor al-Thani and Italian Matteo Nicolini clinched third overall and the final podium place in Qatar 96, while Doha-based team mate Abdullah al-Sulaiti and new partner Luca Nicolini were fourth. The dramatic race, which took place under the shadow of the historic Acropolis, was won by Class 1 newcomer Arif Said al-Zafeen and Jean-Marc Sanchez in Victory 77. Eleven powerful Class One boats roared into action in front of a curious Greek crowd this afternoon and the scream of high-revving Sterling V8, Lamborghini V12, Victory V12 and Skema V12 engines signalled that the new Class One racing season had fired into life with a vengeance. Sheikh Hassan and Italian throttleman Nicolini began today’s race in fourth position, behind the Norwegian Jotun boat, crewed by Christian Zaborowski and Jorn Tanberg, the Spirit of Norway boat, which clinched the title last year, and Victory 7. The latter was crewed by the UAE’s Ahmed al-Suwaidi and Nadir Bin Hendi. Al-Sulaiti and Luca Nicolini started fifth following yesterday’s practice session to determine the race starting order. 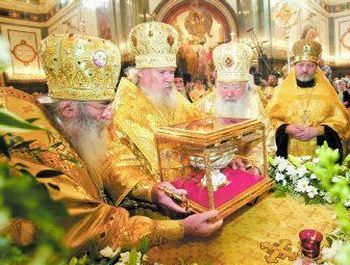 Russian Orthodox Patriarch Alexy II, second from left, places a box from Greece’s Mount Athos in Christ the Savior Cathedral in Moscow on Saturday. The box, containing what is believed to be the head of St. Luke, will be on display until next Sunday. It will then travel to other cities in Russia, Ukraine and Belarus. Further reading > St. Luke relic brought to Moscow from Greece. Posted by grhomeboy in Architecture Cyprus, Cyprus Nicosia, Greek Taste Local. One of the first parts of the old town to be successfully renovated was Chrysaliniotissa. The area has its own crafts centre which now boasts a very European coffee shop. A lot has been written about the historical centre of Nicosia, the old inhabitants, its multicultural image, not as new as one might think, and the efforts for its revival. Part of that effort is the Nicosia Master Plan and the rehabilitation of the inner city, which includes Chrysaliniotissa and the area’s craft centre. The area takes its name from the oldest Byzantine church in Nicosia, dedicated to “Our Lady of the Golden Flax” that was built in 1463 by the Lusignan Queen Eleni Paleologina, whose origins were Greek. The Chrysaliniotissa revitalisation project was selected as the first to be implemented because of the outstanding architectural character the area displayed, and taking a look around proves just that. An Icelander has now been added to the long list of foreigners that have fallen in love with the old part of Nicosia. Inga Hadjipanayi came to the island as a tourist in 1983, a young teenager not knowing what the future held. More than two decades later, Inga is still here, trying her hand at an exciting new challenge. The mother of four has never worked in her life and venturing into business on her own was daunting to say the least. “When the first customer came through the door of the Coffee Nest, I was petrified,” she said. The small, quaint coffee shop come diner started operation under Inga’s management back in November 2006 at the Chrysaliniotissa Craft Centre. “A few years before, I came with a friend to tour the area and the nearby sights and fell in love with the whole concept of the centre as well as the area. At the time, an old lady was running the coffee shop and just the basics were on offer.” Nothing came of it until recently when the shop was vacated. The establishment is found at one end of the complex, neighbouring the craft shops. The Coffee Nest’s main door, flanked by a tall window on each side, opens to the road and the slow daily grind of the ageing residents. The east-facing door opens on to a little square and wooden pergola with a canvas ceiling, offers solace from the summer heat. A small number of tables and chairs scattered on the stoned surface beckon the weary traveller to quench his thirst. The shop also offers wholesome food at reasonable prices, friendly faces and good service. It provides an alternative menu to the stale and unimaginative dishes that major outlets offer and also has the advantage of being a venue steeped in history. Inga plans on holding knitting club meetings at the shop as she is an accomplished knitter too. The idea is to attract likeminded people that crave some companionship or knitting guidance. An art exhibition of prints by English-born Alexandra Storer is currently displayed on the coffee shop’s walls. The centre as a whole has something of a 50s neighbourhood feel to it as one of the artisans at the centre explained: “it reminds me of my hometown, Kyrenia. I can hear the Christian church bells tolling and after a while I can hear the muezzin calling the faithful to prayer from the nearby mosque.” Inga says she feels “at home” and “right to be here” and if it wasn’t for some minor problems with the hot weather everything would be perfect. “The first five years were the worst. I couldn’t bear the heat but now it’s a lot better,” she said. Chrysaliniotissa Craft Centre, 2 Dimonaktos Street, Nicosia. For info call 22 344674. Posted by grhomeboy in Arts Exhibitions Cyprus. Word of mouth has it that ‘Supernova-Constellations’ is set to be one of the biggest exhibitions of the summer. So this must be a show about the weird and wonderful workings of outer space, right? My mind drifts to the most impressive, explosive phenomena that occur at the end of a star’s life-cycle. The matter of a star undergoes tremendous condensation and then explodes, releasing huge amounts of energy. The supernova explosion, which lasts several days, is fierce and bright as millions of stars collide. At the end, the clouds of dust released not only assist in the creation of new stars, but also enrich them with heavy elements. I’m somewhat bewildered however when I find out that this is not an exhibition about space at all. It’s actually a contemporary art show all about geometric abstraction, set to open at the Nicosia Municipal Arts Centre, Old Power House, on Friday. With 27 artists from Britain, Greece and Cyprus participating, it consists of two elements. ‘Supernova’, featuring British artists, was first curated by Caroline Douglas at the British Council, and in response to this, was followed by the creation of ‘Constellations’ featuring Cypriot and Greek artists, curated by Yiannis Toumazis. Failing to see the connection between ‘supernova-constellations’ and geometric abstraction in art, I’m quickly assured that the name of the exhibition was not arbitrarily given. Geometric abstraction in art, once considered the pinnacle of Modernism, suffered successive heavy blows during the last few decades of the 20th century. It was proven to be neither as simple nor as lucid as its exponents suggested. This is where a new generation of artists have decided to turn the tables, inspired to reinterpret geometric abstraction, exploiting the initial explosive potency and energy of the art form in their own way. “The artists have taken geometric abstraction as we know it to have been in the 50s and 60s, and created a new explosion, an explosion of ideas and inspiration that stems from art of the past,” says Toumazis. Rather than disregarding geometric abstraction as a long gone art form, it has been transmuted and is exploring new worlds. “While utopian ideas of modernism may have failed, geometric abstraction remains a very strong word in the vocabulary of the history of art,” Toumazis explains. And while abstraction lies very much at the core of this exhibition, the works themselves cover a wide range and diverse spectrum with paintings, sculptures, video and installations on show. “It’s full of personal comments,” Toumazis says, “each taking a different direction and playing with different mediums.” Some artists show that abstraction can be injected with wit and suspense; others show the way in which dexterous modifications can lead to unusual variations of perception. You certainly won’t be able to ignore the large sculptural work of Liam Gillick who has created a super sized perspex cube that forces you to walk around its edges and explore the surrounding space. The ‘Monument’ video by Jane and Louise Wilson is also notable in its approach to Victor Pasmore’s celebrated ‘Apollo Monument’ at Peterlee. In an elegiac manner, children are shown playing in a concrete structure unaware that it was once a special monument of the modern aesthetic. As for the Cypriot participants in the show, Stelios Votsis’ work cannot go unmentioned. Although he belongs to a past generation of artists, he’s passionate about the idea of geometry on canvas and continues to create with a certain freshness that Toumazis felt could not be left out of the exhibition. Theodoulos Gregoriou’s glass cube, on the other hand, introduces the viewer to geometry of continual transformation and its never ending multiplications towards infinity. The work of the young Greek artists is also very interesting. Nikos Kanarelis superimposes old images on modern work to create fresh new ideas on canvas. Athanasios Argianas is a musician who tries to visualise his compositions in a geometric way, creating enticing installations. “It’s a striking show, full of explosive colours that is really something different. It’s one of the most impressive shows ever presented at the power house,” says Toumazis. Special guided tours have been planned to fill you in on all the little details worth being aware of as you view the works, and special educational programmes for children have also been organised. Supernova-Constellations > A major two-fold exhibition examining how new generations of artists from Cyprus, Greece and U.K have been inspired to interpret geometric abstraction. Opens June 15, 8pm, until July 22. Nicosia Municipal Arts Centre, Old Nicosia. Tuesday-Saturday 10am-3pm and 5pm-11pm. Sunday: 10am-4pm. Closed Mondays. For info call 22 787400. June 16 > A tour by Deborah Prosser and Yiannis Toumazis, 11am. June 27, July 11 and 18 > A tour by Andrea Constandinou, 6.30pm. For information and reservations call 22 787400. Let’s Colour the Stars > Children’s educational programme beginning with a tour of the Supernova-Constellations exhibition and continues with creative activities at the new Educational Centre for Children of the Old Power House. For children 8-12 years old. June 28, July 5, 12 and 19. 5pm-7pm. For info call 22 797400. Posted by grhomeboy in Arts Events Cyprus, Arts Exhibitions Cyprus, Arts Festivals, Music Life Live Gigs. Travels to Italy are usually associated with eating vast amounts of delicious food and spending hours sightseeing. Then there’s all the cultural activities that seem endless, be it a visit to a Museum or watching a theatre performance, there’s nothing quite like the passion of the locals when they put on a show or sweep you away with a breathtaking concert. Forget hopping on a plane to enjoy everything the beautiful country of Cyprus has to offer as the Italian Embassy has brought a taste of Italy to our doorstep this summer. For some renaissance and baroque music you can go along to a concert by the Musica Ricercata Ensemble set to play in Nicosia on June 15 and Larnaca on June 16. Based in Florence and often travelling around the world to put on shows, the chamber music ensemble will be playing pieces from the 15th to the 17th century. Some of it is dedicated to the myth of Aphrodite, while other pieces played were composed for Shakespeare’s theatre. June 22 marks the opening of ‘Mythos’, an exhibition of modern and contemporary art at the Evagoras Lanitis Centre in Limassol. ‘Mythos’ has already met with great success in Athens and Monte Carlo and will continue its tour to other European capitals once it closes in Cyprus. With over 70 works, there will be a number of great artists on show including Sartorio, Chini, De Chirico and Kounellis. All the work draws on the rich myths and legends shared in the Mediterranean culture. As the festival draws to a close at the end of July, you may be interested in going along to a concert by Lucio Calla in the Municipal Garden Theatre of Limassol where he’ll be singing his heart out with some of the best hits of his 30-year career. Viva Italia! June 16 > Larnaca Medieval Fort, Larnaca, 9pm. Free Entrance. For info call 22 357718. Mythos > Exhibition of modern and contemporary Italian art. Opens June 22, 7.30pm, until July 22. Evagoras Lanitis Centre, Carob Mill, Limassol. Visiting hours 10am-1pm and 5pm-10pm daily. Saturday and Sunday 5pm-10pm. For info call 25 342123. Lucio Dalla > A contemporary music concert. July 27 > Municipal Garden Theatre, Limassol. 9pm. For info call 25 878744. Posted by grhomeboy in Cyprus Limassol, Greek Taste Local. We all need a bit off a cool off in the evening as the summer days just keep on getting hotter. One beach bar after another has recently sprung up along the Limassol sea front and last week saw the official summer opening party of the classy Drops beach bar. In a nutshell, the bar just screams ‘glam’ and the word on the street has it that it’s set to be the hottest spot of the summer. Truth be told, it’s often the case in Cyprus that as soon as a new place has its opening party, the crowds rush to be seen there. But if you don’t want to become part of that ‘crowd’, it’s definitely worth going along to Drops when things are a little quieter during the week. It’s a great place to relax after an afternoon swim and you can enjoy a natter with friends in the comfy wicker chairs. As the night falls, you can sit on the trendy bar stools and even have a nibble as snacks and grilled items are served until 10pm. As for the music, it’s a mix of mainstream English and Greek hits. Drops Cafe-Beach Bar > Open for snacks and drinks during the day, with music and dancing at night. Drops Beach Bar, 17 Amathunda Avenue, Limassol, Cyprus. 9am-3am. Telephone 25 310310. We often jump at the chance to go along and watch international musicians who arrive on our shores, but how about supporting the efforts of local musicians striving to put Cyprus on the map of the international music scene? A local band that hopes to make a mightly impression is the Cyprus Big Band, the first jazz orchestra to be established on the island. Founded by Jeunesses Musicales Cyprus and supported by Cyprus College, its mission is to promote, preserve and perform jazz and Latin music in Cyprus, to contribute to the cultural infrastructure of local musical life and go on to present it overseas. The band will be playing at the PASYDY auditorium in Nicosia on Thursday evening and in Limassol next Monday with a special concert at the Rialto Theatre. Aspiring to become the National Jazz Orchestra of Cyprus, the members are all recognised performers, having graduated from renowned American and European music schools. Consisting of alto, tenor and baritone saxophones, two trumpets, trombone, piano, bass and drums, its repertoire is built on historical development of American and European jazz and Latin music, covering all its stages and styles from the beginning of 20th century until today. For the upcoming concert in Limassol, the Big Band is preparing original pieces from North and South America arranged especially for this type of orchestra. Cyprus Big Band > A historic retrospective of orchestral jazz music from the beginning of the 20th century to the latest trends. With a band of nine members established by the Jeunesses Musicales Cyprus. June 14 > PASYDY Theatre, Nicosia. Tickets £8-5. For info call 22 844444. June 18 > Rialto Theatre, Heroes Square, Limassol. Tickets £8-5. For info call 77777745.